(CN) – An unauthorized immigrant center in Rome is raided and shut down by police. A protester shouting “buffoon” from across a street at Italy’s far-right deputy prime minister is detained by undercover police. Journalists are insulted by being called “jackals” and “whores” by political leaders protest across the country. All the while, the Italian government pushes ahead with an anti-austerity spending plan that raises alarms it could spark a European financial crisis. This week, Italy is once again at the center of attention in Europe as its populist government forges ahead with actions that put into the spotlight the thorniest – and existential – issues at the heart of debates in Europe. Italy is, indeed, testing Europe. On Tuesday, its government refused to back down on budget promises to increase spending on unemployment benefits and pensions and cut taxes. The government says it needs to boost spending to lift Italy’s stagnant economy. In an unprecedented move, the European Commission rejected that budget proposal in October, saying it violated the EU’s rules to curb debt. Now the commission will consider imposing hefty fines on Italy. Italy struggles under crippling public debt, inherited from overspending going back to the 1980s. Its debt stands at more than 130 percent of gross domestic product, or about $2.6 trillion. In 2017, it spent about the same on servicing its debt as it did on education, EU officials said. Per-capita income has been stuck at the same level for about 25 years. Its population is leaving too: About 200,000 people emigrate each year to find work outside Italy. But years of public spending cuts and efforts to reduce its debt also are blamed for creating Italy’s economic stagnation – and therefore seen as setting the stage for the election of the populist coalition government in March. Italy is led by a maverick anti-establishment party known as the 5-Star Movement and a far-right party known as the League. The League grew into a political force in the 1980s out of a desire to make rich northern Italy separate from a poorer southern Italy. The League is led by Matteo Salvini, Italy’s interior minister and deputy prime minister who has made expelling immigrants from Africa and Asia a pivotal aim. His hard-line policies on immigration were again put into practice Tuesday. Police raided an immigration camp in Rome known as the Baobab Experience and closed it down. About 200 immigrants were sleeping at the center, according to news reports. On the same day, Italian journalists across the country held protests in piazzas to show their outrage over being labeled “whores” and “jackals” by prominent leaders of the 5-Star Movement. They blasted the movement’s leader, Deputy Prime Minister Luigi Di Maio, and others in the party for their antagonism toward journalists. The 5-Star Movement’s attacks on journalists ratcheted up after Rome Mayor Virginia Raggi, a prominent 5-Star member, was recently acquitted of a corruption charge. Her case received heavy media coverage, much of it critical. Fears over growing authoritarian rule were fueled on Monday when Italian news outlets reported on another incident involving Salvini. On video, a 59-year-old woman was seen whistling and shouting “buffoon” at Salvini as he arrived at an event in Rome when undercover police forced her aside and reportedly took her in for questioning at a police station. “Does the government by any chance intend [on] abolishing articles 17 and 21 of the Constitution which allow citizens to freely express their thoughts and to gather peacefully?” two opposition politicians with the Democratic Party said. 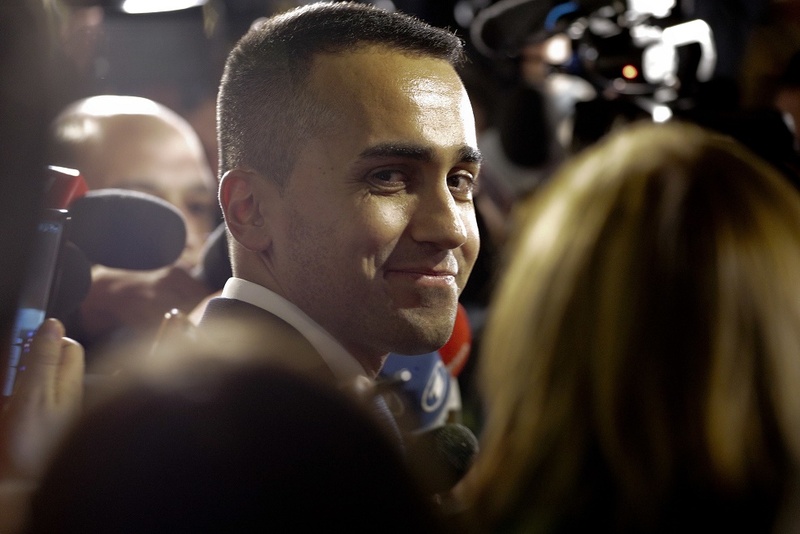 In many ways, the tense atmosphere in Italy between government supporters and critics who say the country is drifting toward anti-democratic authoritarianism can be explained by economics, analysts say. And this is why the fight over the budget is seen as critical in determining the future of Italy, and Europe. Luigi Zingales, an Italian economist at the University of Chicago, urged in a New York Times column that the EU should be flexible with Italy on its fiscal demands. “The best way to prevent the worst form of populism from spreading — which is in the interests of both the European Union commissioners and Italian citizens — is recognizing and addressing the legitimate grievances that a large fraction of the population has voiced in electing this new Italian government,” he wrote. But, he worried, both the EU and Italy have political interests in keeping the battle going. For many in Europe, most prominently French President Emmanuel Macron, Salvini is now an enemy, a symbol of the spread of far-right populism in Europe. Defeating him on the budget, then, could be viewed as a win against populism. For their part, Salvini and the 5-Star Movement hope to gain politically by portraying Europe as the enemy. Varoufakis is among those advocating reforms that would include more spending and investment across Europe, in particular with emphasis on green projects. Generally, there is agreement among policymakers and analysts that the eurozone is in need of major reforms to stave off a deepening of economic problems, and the unraveling of the EU. But agreeing on what changes to make and then implementing them will not be easy.